Fortnite is an incredibly popular Battle Royale multiplayer game that is available on pretty much any platform you can play games on. The game has millions of players and received a ton of public spotlight earlier in 2018 when Drake and Travis Scott played with popular Twitch streamer Ninja. With so much mainstream appeal, Fortnite has cemented itself in the culture and continues to grow and make changes in order to keep fans playing. Now it appears as though the game is about to break new ground, as some new leaks point to a potential performance from EDM artists Marshmello that would take place live in the game. 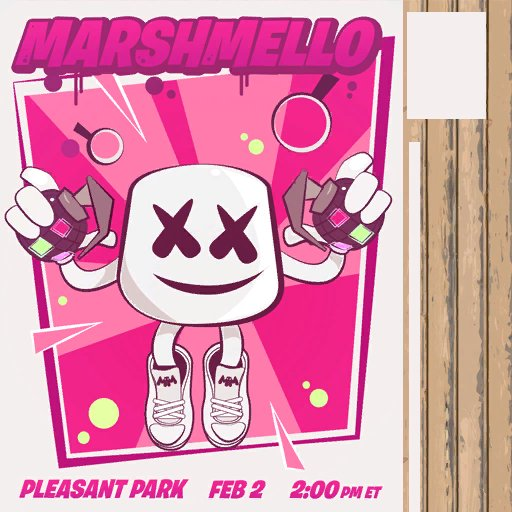 An image which appeared on fortnitenews.com shows a Marshmello poster that points to a concert occurring on Saturday, February 2nd at 2 P.M. There are also some Marshmello skins that were found in the games files by some sneaky data-miners. Epic Games hasn't come out and confirmed anything just yet but the evidence pointing towards this events existence is pretty compelling so far. It is also said that this event will take place in Pleasant Park and respawning will be enabled so expect the concert to be a part of its own unique game mode. Will any of the Fortnite players out there be checking this out on Saturday?